Movie Review: George Clooney stars in “Tomorrowland”, a futuristic Walt Disney Studios saga that didn’t show sufficient motives for being considered remarkable despite its well-intentioned message. This is the second participation of Clooney in a sci-fi in two years, after the stunning “Gravity”, but the renowned actor didn’t exceed the expectations here, likely due to a discouraging plot packed with too many dimensions and time travels, assembled without a solid structural dorsal spine. The animator Brad Bird, author of “Ratatouille” and “The Incredibles”, directed the film. Only this time, on the contrary of the mentioned movies, he was very far from triumph. What went wrong? The performances? The special-effects? The plot? Well, I would say a bit of all these aspects, aggravated with the use of an intrusive, old-fashioned score, and a structure that jolts intermittently. The movie starts with the inventor Frank Walker (Clooney) talking about the future to an indistinct audience, being constantly interrupted by the voice of a woman. Casey Newton (Britt Robertson) is her name - an optimistic young tech-savvy who played a key role in the past when she received a time-shifting pin that took her straight into the future. During that time, she was protected by Athena (Raffey Cassidy), a self-conscious girl-shaped animatronic robot whose mission was to recruit the ‘special ones’ in order to recover a condemned world. Combating against evil robots, the three of them will try to reach their final destination: a mysterious place known as Tomorrowland whose ruler is David Nix (Hugh Laurie), an old acquaintance of Frank and Athena, who failed to be the heinous villain the story required. 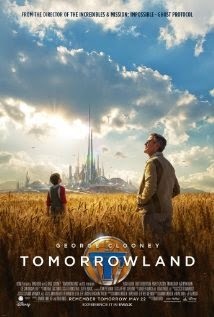 “Tomorrowland” is noble in its efforts and morals, but lacked spontaneity in the acting, nerve in its visuals, and strength in the narrative. Inauspiciously familiar, this is just another sci-fi that promises more than it gives.